Home » Who is Stephen Davis? Stephen Davis, unmasked, is an Anglican cleric and former director of the International Centre for Reconciliation. An Anglican cleric, Stephen Davis, 63, has a Ph.D. in political geography and has worked as an adviser to the past two presidents of Nigeria. He established extensive contacts with tribes and terrorist groups in Africa, including three small cells of Al Qaeda, while working as a trouble-shooter for oil and gas company Shell in the Niger Delta. Stephen was instrumental in brokering a negotiated settlement in 2009 with the rebels there. I specialise in negotiation. It may interest you to know that I have been involved in peace negotiations in Nigeria since 2004 when President Olusegun Obasanjo invited me to intervene in the Niger Delta crisis. With a local Nigerian colleague, I spoke with Asari Dokubo and took him to Obasanjo at the Presidential Villa in Abuja. Because Asari is a Muslim, the Muslim boys in the north heard about me and warmed up to me. I did a report in 2005 on the threat of extremism among young northern Muslims. Obasanjo’s security chiefs dismissed the report with a wave of the hand. They said no such thing existed. In 2007, President Umaru Musa Yar’Adua, who desired to end the militancy in the Niger Delta, invited me and made me presidential envoy. I toured all the northern states. I went to the country’s borders. I came back with a report that there were some budding sects in the north. The national security adviser (NSA) at the time, Gen. Sarki Mukhtar, dismissed the report. He said they didn’t exist. A succession of NSAs dismissed all these reports and allowed the groups to flourish. By the time President Goodluck Jonathan came to power in 2011, these groups had spread all over the north. They had cells and commanders in 16 out of the 19 northern states. President Jonathan called me and sought my opinion on the best way to tackle the militancy and bring it to an end. I knew many of the leaders. I spoke with them. They trusted me. They initially wanted to kill me. They thought I was an American but I told them I was not. They also thought I was British but I said I was not. I told them I was an Australian. They relaxed. I don’t know why but they became more accommodating. They became friendly and, gradually, we built the trust. They started feeling free with me. I don’t call them Boko Haram. I call them JAS. People call them Boko Haram. 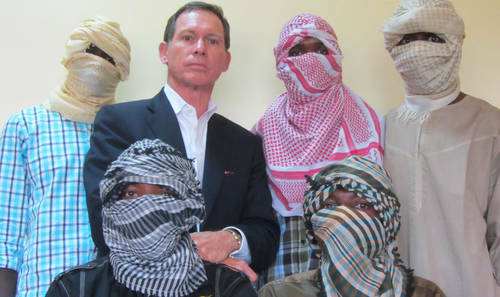 They don’t call themselves Boko Haram.